What’s for lunch in April? | SENIOR CITIZENS OF PATAGONIA, INC.
SENIOR CITIZENS OF PATAGONIA, INC.
HomeWhat’s for lunch in April? 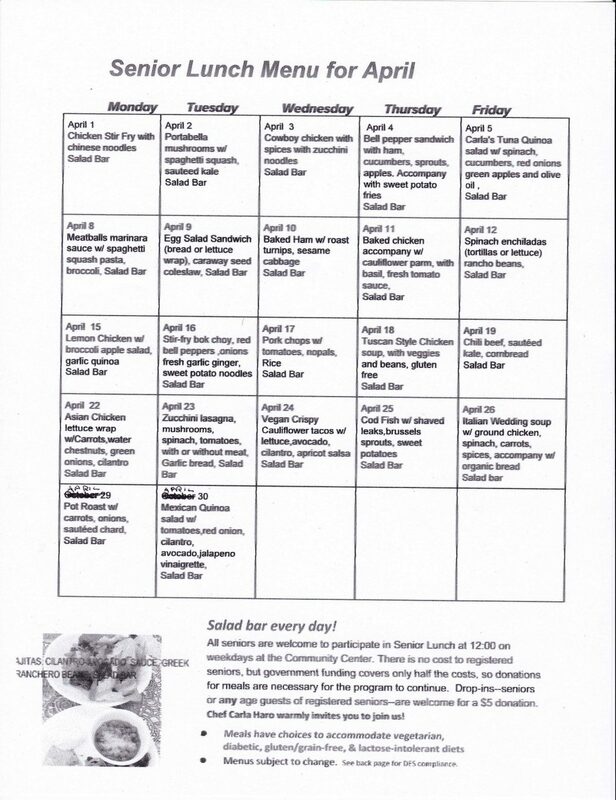 What’s for lunch in April? SCP's latest Title VI Non Discrimination documents, forms and procedures are on-line here under the Title VI Civil Rights tab. There are forms in English and Spanish you can file if you feel you have been discriminated against in using SCP programs. The Santa Cruz County Bridge Club plays bridge on the 1st, 3rd and 5th Mondays of the month at the air-conditioned Saint Therese Parish Hall in Patagonia. The Hall is located just east of the church on the corner of 3rd and Sonoita Avenues and games begin at 12 noon. Contact Jim at 626-806-7788 for more information.